HSBC recently released its latest survey, Learning for Life, covering 5,500 parents in 16 countries around the world, showing that 77% would consider sending their child to study abroad either for undergraduate or postgraduate studies. The latest installment of HSBC’s The Value of Education research series, Learning for Life is based on a comprehensive national survey of parents around the world who have at least one child aged 23 years old or younger. It was conducted online by Ipsos MORI in March and April 2015 (with supplemental in-person interviews in the UAE). The 16 countries sample included countries popular for sending students abroad like Brazil, China, India, Indonesia, Mexico and Turkey. Research showed that close to two thirds (64%) of parents would consider study abroad for their children’s undergraduate studies, with an even higher majority (70%) considering postgraduate study. The report affirms that globally, parents in Asia are most receptive to send their child abroad for undergraduate study. Malaysia leads the way with four out of five parents (80%) open to the idea, followed by Hong Kong, Indonesia and Singapore at 74%. Expectedly, only around half of parents in western countries – Canada (51%), Australia (52%) and France (53%) – would consider sending their child to study abroad. The survey also highlighted a number of key countries as probably hotspots for postgraduate demand – 88% of parents in India, followed by Turkey (83%), China and Malaysia (82%) lead the countries for those most likely to consider overseas postgraduate studies for their children. Interestingly, nearly eight in ten (78%) parents believed their children’s prospect for becoming more knowledge as a strong benefit of a university education. Moreover, half of these parents believed their children has more opportunity today to study abroad as compared to their own generation, a promising trend on the increasing importance of higher education. Over half (51%) also saw studying abroad as a beneficial opportunity for their children to experience life and cultures abroad. The survey showed that just 34% of parents would not consider overseas education for their children because of cost. The level of interest to consider study abroad indicated that perceptions of the relative quality of education as an important factor to consider. The report stated, “The quality of education is also a factor in deterring parents from considering an international university education for their children.” More interestingly, parents in Asia feel that the quality of higher education offered in their home country is superior. 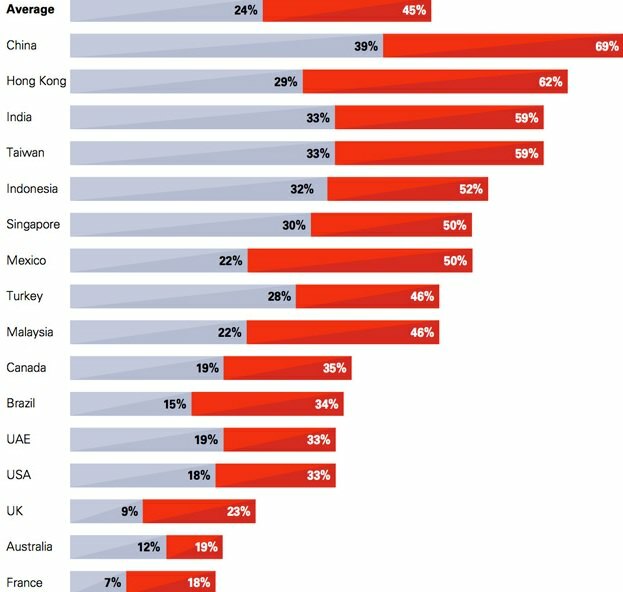 This was the sentiment also shared by the survey which found that “Of parents who would not consider this option [to pursue higher education abroad], over a quarter (26%) think that their home country offers a superior university education; rising to around half in Singapore (53%), Malaysia (48%) and India (47%). On the subject of higher costs, the survey noted that those open to sending their children to study abroad are willing to pay more for university studies overseas than they would pay in their home country. In fact, four out of five (80%) would consider paying more for an overseas education. The chart below points out that close to half (45%) are open to pay up to 25% more (than the cost of a studying university locally), while just under a quarter (24%) would consider paying up to 50% more for studying university abroad. HSBC’s Learning for Life survey covered a wide range of touchpoints from developed and emerging countries. It is in that context that such global findings must be very carefully considered. The overall objective of the HSBC research was to come up with an evidence-based sense perspective apart from the sentiments in the marketplace. As parents play an important role in the decision-making process to studying overseas for many students, the findings are very telling and valuable indeed. The results of this survey clearly affirms the growing importance and impact of higher education led by the demand from emerging economies like India, China and Turkey and supplied by key notable education countries like Australia, America and United Kingdom. With the continued rise of the middle class and economies from emerging countries, it is likely that this trend will continue to grow. Furthermore, as more and more youths continue to consume such content and information, it is imperative that institutions around the world realize this movement to leverage and expose their brand effectively through the right communication channels.